Temporary Resident Permits Adventure Immigration Services Inc.
A temporary resident permit (TRP) pursuant to section A24(1) of the Immigration and Refugee Protection Act (IRPA) is a discretionary document that may be issued to inadmissible persons or persons reported or who may be reported for violation of the IRPA allowing them to enter or remain in Canada, where justified by exceptional circumstances. A permit may be issued for up to three years. It may be extended or cancelled by an immigration officer. If the period of validity elapses, the person must apply for a new permit, which marks a break in continuity (see below). The permit is no longer valid if the permit holder leaves Canada, unless re-entry has specifically been authorized. A temporary resident permit is a document that can carry privileges greater than those accorded to visitors, students, and workers with temporary resident status. For example, it allows application inland for a work or study permit, and may give access to health or other social services. There is no discretion involved in granting permanent residence to persons who meet the requirements of the permit holder class. Persons who remain continuously in Canada on a permit for the specified time and do not become inadmissible on other grounds will be granted permanent residence. not eligible for renewal of status. A permit may be cancelled at any time. The permit is deemed cancelled when the permit holder leaves Canada, unless the document authorizes re-entry. are inadmissible on grounds of having come to Canada as an accompanying family member of a person described in the box above. There is no provision to allow members of the permit holder class to include family members on their applications for permanent residence. At the time of their original entry into Canada, members of the permit holder class are inadmissible under paragraph A42(b) on grounds of being an accompanying family member of a foreign national who is inadmissible under A38(1) or A42(a). Consequently, they would require their own permit. In order to be considered for permanent residence, such individuals would need to submit their own applications under the permit holder class as principal applicants. Family members living abroad who are eligible for membership in the Family Class may be sponsored once a member of the permit holder class has attained permanent resident status. If accepted in the permit holder class, an applicant is not required to pay the right of permanent residence fee, provided they are a dependent child of another member of the permit holder class who has already submitted an application for permanent residence. 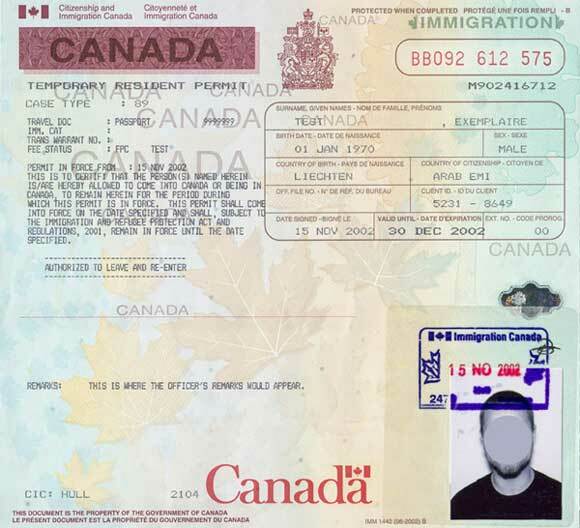 Permit holders are not eligible for permanent residence if they do not meet the requirement of continuous residence in Canada, i.e., there has been a break in continuity. A break in continuity occurs when permit holders, without authorization for re-entry, leave Canada, or when they neglect their responsibility to seek an extension of their status prior to the expiry of their permit. As of June 29, 2010 failed asylum claimants whose final decisions were rendered within the last 12 months are immediately subject to the bar on requests for TRPs for 12 months from the date that their claim was rejected (or deemed to be abandoned or withdrawn). However, requests for TRPs submitted prior to June 29, 2010 will be “grandfathered” and assessed per the previous legislation.